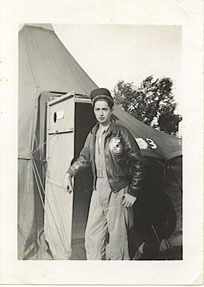 S/Sgt Wayne Whiteleather in front of his enlisted man`s tent in the 757th Bomb Squadron area in 1944. 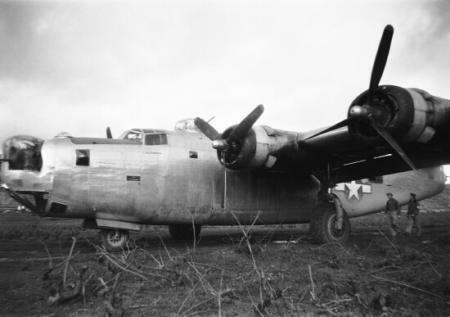 Lt Purman,Pilot and Co-pilot Jack Campbell checking out damages to their B-24 44-41161 after crash landing. 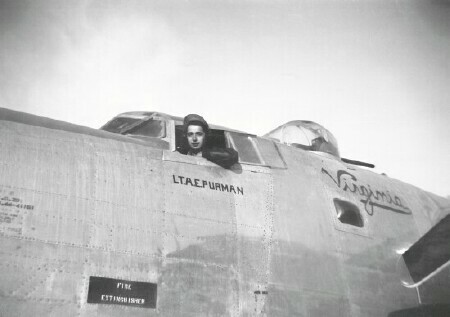 It was not flyable, so they left in a B-17 for Italy. Front row: S/Sgt Sidney S Rhum - Nose Gunner, Asst. 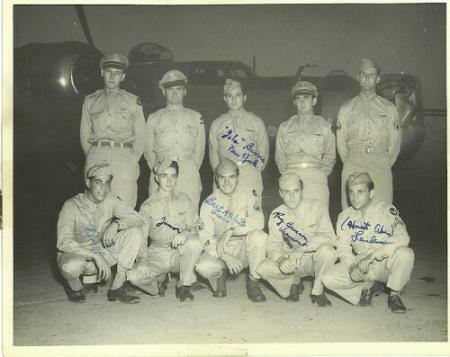 Engineer; S/Sgt Wayne B Whiteleather - Ball Turret Gunner; S/Sgt Bart A Waits - Radio Operator; S/Sgt Raymond J Brisson - Tail Gunner; S/ Sgt Abraham Landsman - Engineer/Top Turret Gunner; Kirk Rapheal was listed in crew but not known if he flew missions with this crew as crew did not have a permanent navigator. The following information on Wayne Whiteleather is gathered and extracted from military records. We have many documents and copies of documents, including military award documents. It is from these documents that we have found this information on S/Sgt Whiteleather. These serviceman's records are nowhere near complete and we are always looking for more material. If you can help add to Wayne Whiteleather's military record please contact us. Please contact us with any biographical data, pictures or other information regarding the service and life of Wayne Whiteleather.